Another catch 22 of being a new mum, getting stressed because you feel like you can’t make enough milk to feed the tiny human you’ve just birthed and stress reducing your milk supply. Seriously, like it’s not stressful enough making sure you work out how to be the best mum you can. 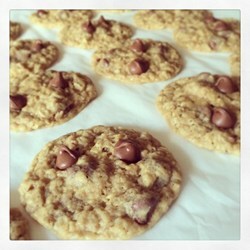 Lactation Cookies are a great addition to any new mums kitchen who chooses to breastfeed. They double as a one handed snack that’s full of nutrients to naturally increase your milk supply. My tip – add the choc chips and any flavour to cover up the brewers yeast, if you get the mix right they are really quite tasty. I served them to a bunch of non feeding visitors, who popped in to visit my newborn. They were either really polite or actually enjoyed them. I had to stop making them when I was surviving on a diet of lactation cookies and cold tea. Mix flaxseed with water in small bowl and let soak for 5 minutes. Beat butter, white sugar, and brown sugar together in a large mixing bowl until creamy. Add egg yolks and vanilla extract; beat to incorporate. Stir flax seed mixture into the butter mixture. Mix flour, brewer’s yeast, wheat germ, baking soda, salt, and cream of tartar in a separate bowl; add to butter mixture and stir until just combined. Fold oats and chocolate chips into the dough. Roll dough into walnut-sized balls and place 2 inches apart onto a baking sheet. Bake in the preheated oven until the edges are golden, 10 to 12 minutes. Allow the cookies to cool on the baking sheet for 1 minute before removing to a wire rack to cool completely. They worked for me, give them a go and let me know if they made a difference for you.